Life is filled with endless curve-balls. That’s why the need to borrow money will always come up from time to time. The good thing is, this is 2018 and technology has made everything easier - including borrowing money. 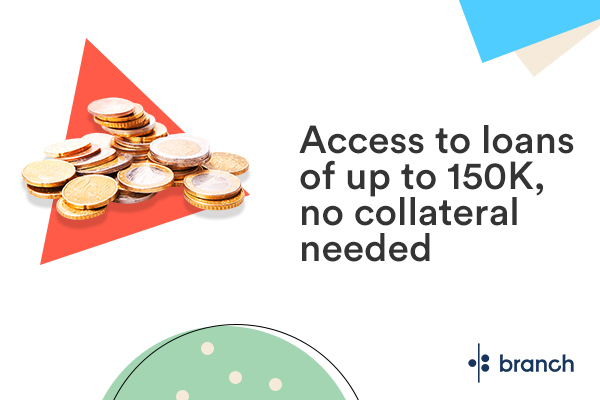 By replacing the need for collateral with a credit score, the Branch app will give you access to loans of up to ₦150,000 for whatever you need or want within minutes. They are in Nigeria, Kenya, Tanzania, Mexico and India so they definitely know the work. Get it here. Careem is launching in Sudan. The ride-hailing company has already hired 10 employees and signed up thousands of drivers. The company plans to re-invest the revenue earned in Sudan back into the country over the next two to three years perhaps due to foreign currency shortages. Careem was earlier reported to be launching its bus service in Egypt this month although local authorities have stalled Uber's plan to acquire it. Uber is celebrating five years in Africa this week. The company so far has 1.3 million riders, 36,000 active driver partners and has covered 1.4 kilometers in Africa since its launch in 2013. The company is offering a discount of 50% off 5 rides (capped at NGN 2,000 per ride with code LAG-AFRICA) until September 16 to celebrate its anniversary. Check out Akindare's timeline of ride-hailing in Africa. ZOLA Electric (formerly OffGrid Electric) is launching its PAYGO solar model in Nigeria, according to an exclusive press release we received. ZOLA plans to deliver electricity via clean energy to 1 million households and businesses in Nigeria over the next three years. ZOLA currently provides clean energy to more than 180,000 homes and businesses across Tanzania, Rwanda, Côte d’Ivoire, and Ghana. Some of its major investors include Tesla, DBL Partners, among others. Off-grid energy startup, Fenix International has reached a milestone of 30,000 households within 9 months of launching in Zambia. The startup which was acquired by Engie, an international utility company, earlier in the year, launched in the country through a partnership with MTN as its mobile money platform. A good number of off-grid energy startups are leveraging mobile money to increase access to electricity in Africa. Tanzanian fintech startup, Nala has won the 2018 Ecobank Fintech Challenge. The startup beat 10 others to win the prize money of $10,000 while SA's Virtual Identity by e4 and Wallet.ng won second and third place with $7,000 and $5,000 respectively. Blockchain bank, Blockbank has acquired a stake in Kenya's Spire Bank. As part of the partnership, Spire Bank will incubate a DDMS smart contract blockchain system that will enable Blockbank provide lower cost funding solutions via its infrastructure. PropertyFox, a South African digital real-estate agency, has acquired local startup Steeple which describes itself as a low-commission estate agent platform. While the amount for the deal was not disclosed, the two startups will be consolidated and PropertyFox will take on all Steeple's customers. The deal will also see PropertyFox add 100 sellers to its platform. Zimbabwe's new Deputy Minister of Transport & Infrastructure, Fortune Chasi, has expressed interest to engage technology experts in the country's transport and infrastructure space. The Deputy Minister said he loved drones and would look into the approval of new drone regulations that will enable pilots fly them legally in the country. The draft regulations have been pending approval since 2016. Liquid Telecom is making major changes to its business in South Africa that has resulted in stock shortages and late payment of commissions to its resellers. It appears the company is transitioning to a B2B and B2G strategy. As a result of this, it is closing two of its SA retail stores and will redirect customers to its call centres. MTN Nigeria is fighting back, the company has sued Nigeria's Central Bank and the Attorney General of the Federation. It is seeking an injunction from the Federal High Court of Nigeria to protect its assets and shareholder rights following the $10 billion authorities are asking it to pay. MTN has maintained that it has done no wrong and that it will continue to engage with the relevant authorities. Safaricom has partnered with the Kenya Red Cross Society to build M-Salama. M-Salama is an SMS-based tool that will offer early warnings on impending natural disasters such as floods, famine, and drought. The Red Cross said it sent out more than ten million early warning messages during the floods in May that guided many families to move to higher ground. Meanwhile, Safaricom's E-commerce platform, Masoko is planning to launch Masoko Fresh to begin the delivery of fruits and vegetables. Spree and Superbalist are merging in a bid to create South Africa's "largest online fashion destination". The merger was first announced in June by Takealot, Superbalist's parent company and will be complete in October. A new company currently called FashionCo which will be managed by Takealot will house the new entity. Egyptian blockchain startup, Elkrem has raised $75,000 from ConsenSys Ventures. The startup plans to use the investment to globally launch their first product, the blockchain development board, via Kickstarter in 2019. It previously raised $250,000 in January. RightMesh is working with crypto-currency exchange Golix to allow Ugandans buy RMesh tokens in the country. The tokens will enable users purchase mobile data via the RightMesh protocol to connect to the internet. This connectivity, according to the company, would give Ugandans the ability to surpass the country's recent social media tax. Following news that it signed an MOU with the Lagos State Government (LASG), Zipline is now hiring for a Nigeria Business Development Role. Although LASG deleted the initial tweet about the MOU, the news was picked up back then and this job ad further confirms the deal. LASG is looking to work with Zipline to improve its healthcare supply-chain. Zipline is also hiring in Ghana (where it signed an MOU in April) as part of its expansion across Africa. Nigerian health-tech startup, mDoc is hiring for a number of roles including Product Suite Lead, Developers, among others. See more details here. + What’s Driving The Uptick In Investments In Africa’s OffGrid Energy Start-Ups? You're a good person. Share this digest.